You know the Sonic Cycle meme, right? Gamers hear about a new Sonic game, they get excited. Then, the game comes out, and it's a huge disappointment. With that kind of letdown baggage, you'd think Sonic would not make a good lucky charm. Then again, you're not Puerto Rican runner Javier Culson, and you didn't just win an Olympic medal. Sporting a Sonic the Hedgehog tattoo on his arm, Culson took the bronze medal in the 400-meter hurdles at the London Olympics. 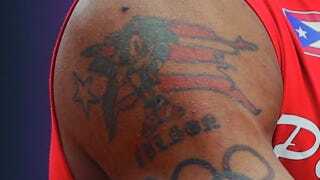 His tattoo depicts Sonic in front of the Puerto Rican flag. Below Sonic, there are the famed Olympic rings. Sonic, of course, is the world's fastest hedgehog, and is able to run faster than the speed of sound. The character even appears in a series of Olympic video games with Mario. Culson is a big Sonic fan, it seems, calling himself "Culsonic" on Twitter. And while it seems like Culson has some of Sonic's speed, thankfully, he doesn't have any of the blue dude's 'tude. Or spikes. Or stupid animal friends.